For both of these conditions, pain is caused by sciatic nerve compression, and lower back pain is often the most pervasive symptom. Invisible piriformis muscle issues, such as overuse, can cause Piriformis Syndrome. When compression is directly related to specific, identifiable physical issues, including disc herniation and lower lumbar spinal degeneration, the correct diagnosis may be Sciatica. If a medical professional suspects that Sciatica or Piriformis Syndrome is causing lower back pain, they may order diagnostic tests, which include a standard physical exam and imaging tests. When imaging tests are necessary, they may include an MRI, CT scan or spinal x-ray. The physical causes of Sciatica may appear on these imaging tests. Piriformis Syndrome won’t be evident on these imaging tests, and no definitive tests for the condition exist. Instead, Piriformis Syndrome is usually diagnosed by reported symptoms, including significant pain or extended numbness when straightening the legs. These two conditions aren’t mutually exclusive. Some patients suffer from both Sciatica and Piriformis Syndrome. Approximately one person in seven has a sciatic nerve that passes straight through the muscle instead of underneath it, which makes nerve compression more likely. In these individuals, Piriformis Syndrome is much more likely to be the correct diagnosis. Sciatic nerve compression causes both conditions, but the exact nature of that compression determines the most effective course of treatment. When faced with a diagnosis of Piriformis Syndrome or Sciatica what helps? 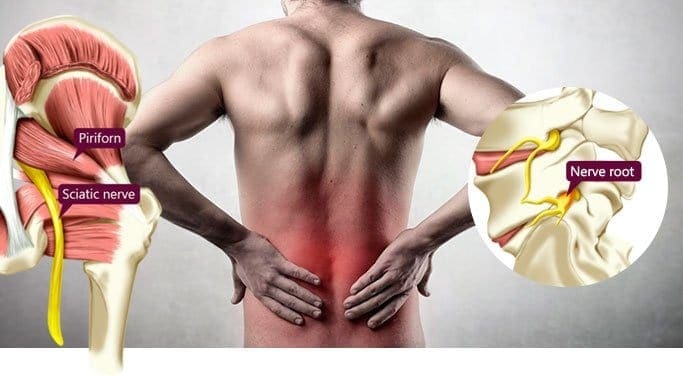 Sciatica treatments often depend on how severe the physical damage is, whether that damage has resulted from disc herniation or something else. Anti-inflammatory medication and regular visits to physical therapy are often effective for managing symptoms. Some cases are so severe that they require treatment with surgery or other medications, including steroid injections. Treatment for Piriformis Syndrome is generally simpler. Physical therapy is sufficient in most cases to manage the symptoms, and chiropractic care can also lessen the pain experienced by sufferers. Anti-inflammatory medication may also help, but it’s often not necessary. Stretching can also relieve symptoms in cases that are caused by overuse of the muscle. In most cases, it provides at least some relief.